Sometimes you discover a dish because a passing waiter brings it to a nearby table and the sight, smell or sizzling sound of it makes you change your order immediately. 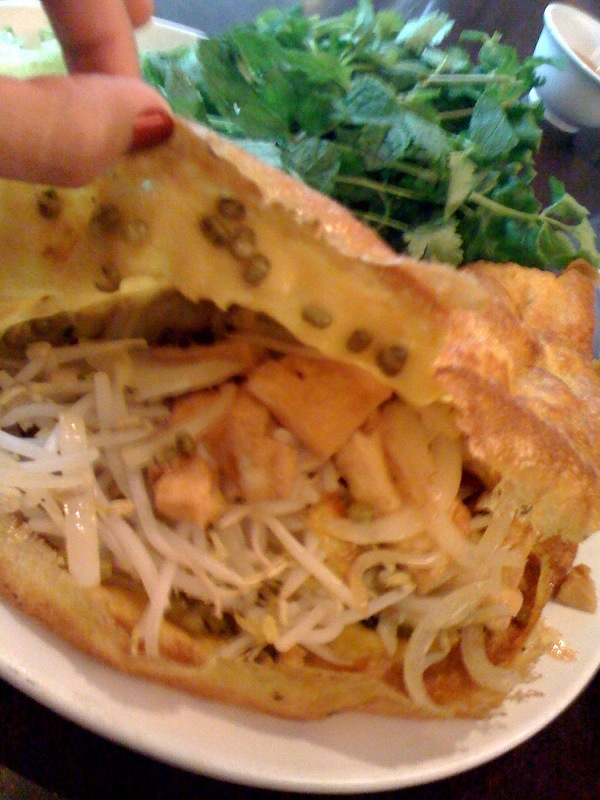 The Vietnamese crispy crepe or Banh Xeo was that dish for me. 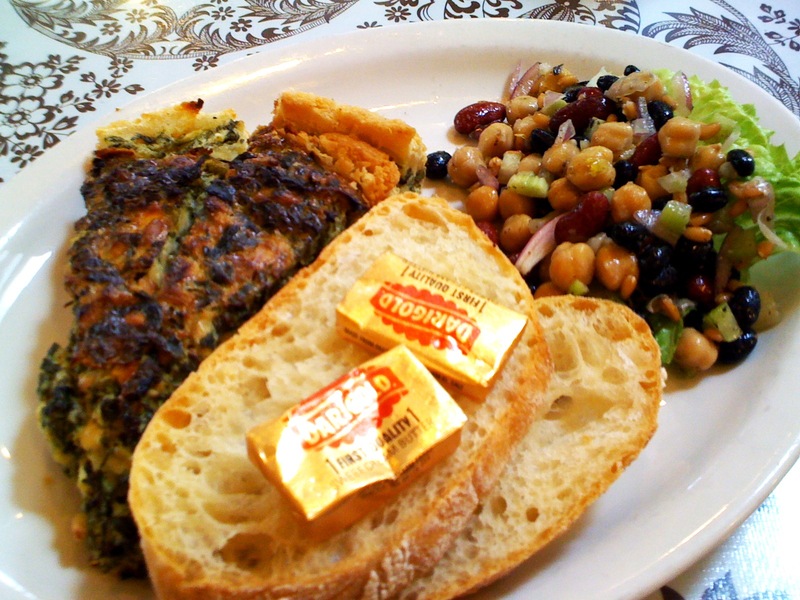 The sheer size of the greens and crepe itself will attract onlookers. I’ve tried this at a couple of spots but my favorite place to get this is at Pho Van. They offer more greens and fillers than other places so I never leave feeling hungry. 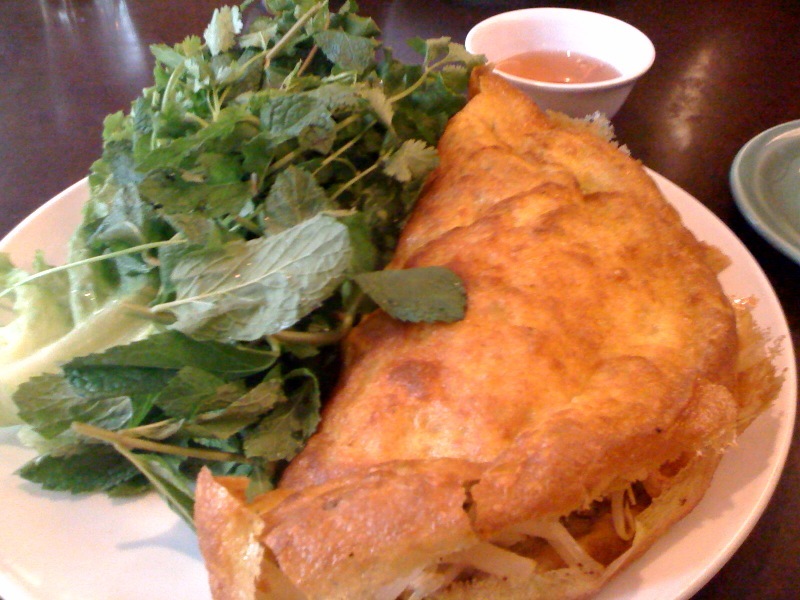 The super thin crepe is made of rice flour with a hint of turmeric and stuffed with shrimp or pork. I ask them for tofu and they usually fill it with a half block (way too much for me but I appreciate how much they offer). There is also mung beans, bean sprouts and onions with the option of adding cilantro, basil and lettuce off to the side. Fantastic! Location: 1919 Southeast 82nd Avenue Portland Oregon but there are additional locations around town. My first food order from this cart were the chickpea fries which I instantly fell in love with so naturally I had to try the sandwich counterpart and it certainly does not disappoint. 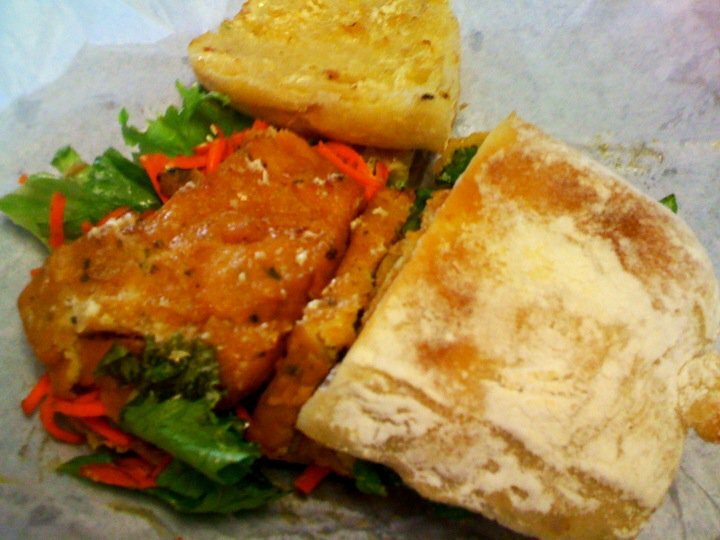 The sandwich is made using a ciabatta roll then a fried garbanzo patty is placed inside along with lettuce, lemon aioli, butternut squash and a carrot slaw. There is sweetness from the carrots and tartness from the aioli which plays well together. A very well constructed veggie friendly sandwich that carnivores and vegetarians alike will enjoy. Very filling but it may be a little chickpea overkill when paired up w/ the fries. I suggest getting the fried risotto ball instead or pick up some regular fries from the falafel place a few carts over. I also want to add that Garden State is one of the only carts in the Mississippi pod that is consistently open during the rainy months. We Oregonians still need to eat!!! I see a lot of carts closing up early or not opening at all when the crowds are not favorable. I’ve come to Garden State on miserable cold and wet days and they are still making food for the handful of people waiting in the rain. The other carts should just close up until spring and put a sign up if they are not willing to open in the rain. Geez. It freaking rains here 4 months straight and that’s being conservative. So thank you Garden State for staying open. My hips might not be so thankful but my stomach sure is. 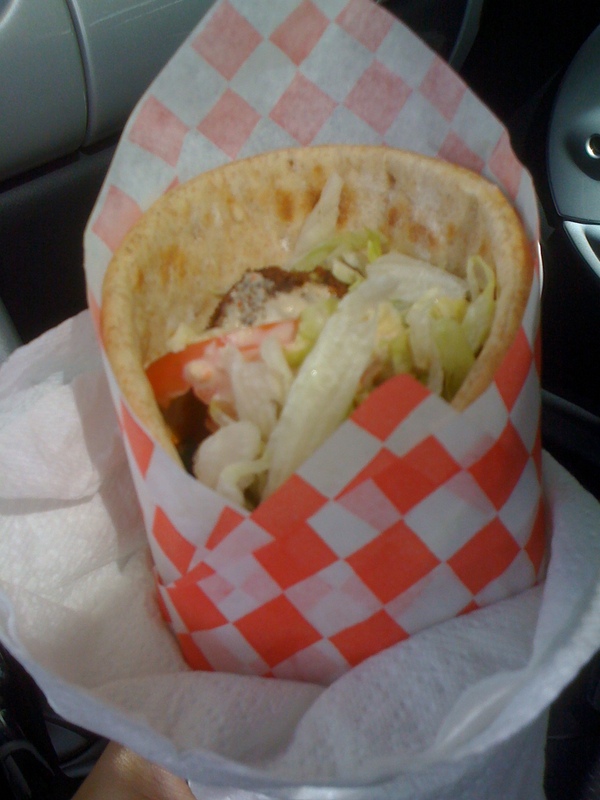 There is a food cart revolution happening in Portland Oregon. Why I love these carts so much is the owners really care about the food they are producing and everything is made to order! This isn’t fast food, it is food fast. Carts are popping up everywhere there is space and although I may never get a chance to eat at each one, I love the fact that I have so many choices around me. My go to spot for lunch is the Native Bowl in the Mississippi Neighborhood in North Portland. This cart is vegan only but don’t let that scare you away. I probably shouldn’t share this bit of information but you can call your order ahead of time (503-330-7616) and forego the wait that can be upwards of 15 minutes on a busy sunny day. The first time I went there, I ordered the Couch Bowl. (In Portland, we pronounce that Cooch” I don’t know why, we just do). I always get the small bowl which comes in a Chinese take out box. I’ve never tried anything else just because I simply LOVE this dish. So what’s in the bowl? 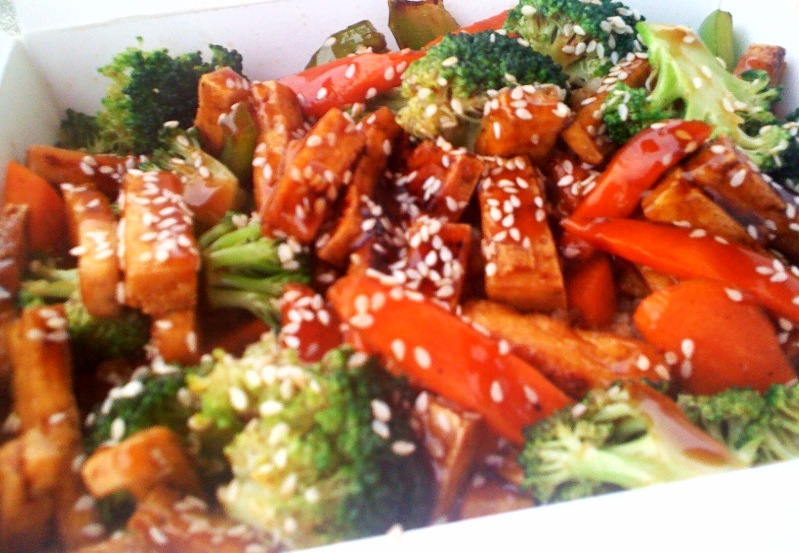 Grilled tofu, sesame bean sprouts, Kochujang sweet and spicy sauce, jasmine rice, organic lettuce, carrots, scallions and toasted sesame seeds. It is mildly spicy and packed with flavor. The moment you open the box you will be intoxicated with the aroma. It is unbelievable! I’ve brought other people who’ve ordered different things and they said their meal was just as good.